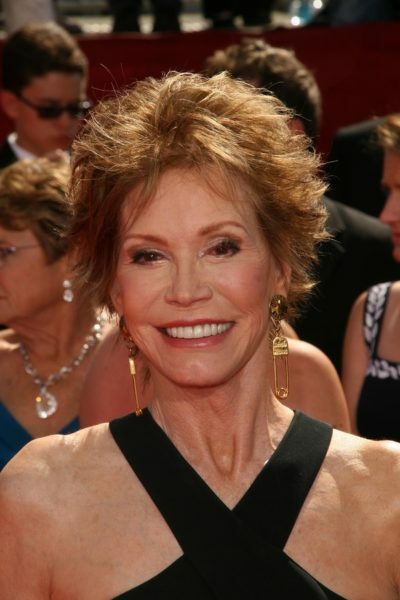 Place of Death: Greenwich, Connecticut, U.S.
Mary Tyler Moore was an American actress. She was the daughter of Marjorie (Hackett) and George Tyler Moore. Her father was of English, Irish, and German ancestry. Her maternal grandparents were English. Mary was married to Robert Levine, until her death. She had a son with her former husband Richard Carleton Meeker. Mary’s patrilineal line can be traced back to her great-great-great-grandfather, John Moor, who was born, c. 1755, in Treswell, Nottinghamshire, England. Mary’s paternal grandfather was George Melville Moore (the son of Lewis Tilghman Moore and Mary E./Fanny/Frances Bragonnier/Bragonier). George was born Virginia, and was of English and German descent. Lewis was the son of John Moore and Mary Catherine Mann or Edith Warren; Lewis owned the house that is now Stonewall Jackson’s Headquarters Museum in Winchester, Virginia. Mary’s great-grandmother Mary was the daughter of The Rev. Daniel George Bragonnier/Bragonier and Mary Elizabeth Shindler. Mary’s paternal grandmother was Anna Veronica Tyler (the daughter of Joseph Henry Tyler and Mary Tressa Cordell). Anna was born in New York. Joseph was the son of Charles Henry Tyler, who was born in Somerset, England, and of Catherine Reilly, who was born in Ireland. Mary’s great-grandmother Mary Tressa was the daughter of Irish parents, John Cordell and Margaret Cline Cooney, who was from Westmeath. Mary’s maternal grandfather was Horace Mansell/Mancell Jones/Hackett (the son of Henry Jones/Hackett and Eliza/Elizabeth Charlotte Jane Gutteridge). Horace was born in Islington, London, England. Henry was the son of John Hackett and Sophia Evans. Eliza was the daughter of Mancell Powell Bagshaw Gutteridge and Eliza Levy. Mary’s maternal grandmother was Mabel Burgess (the daughter of William Daniel Burgess and Sarah Winslow). Mabel was born in Shoreditch, London, England. William was the son of Daniel Matthew Burgess and Mary Ann/Anne Lloyd Aneboney. Sarah was the daughter of Henry John Winslow and Elizabeth Hamilton Gee. Mary evidently believed that one of her grandfathers was Jewish. No Jewish ancestry appears on family trees of Mary Tyler Moore. Mary’s maternal grandfather, Horace Mansell Hackett, was the grandson of Mancell Powell Bagshaw Gutteridge and Eliza Levy. While the surname Levy is often (but not always) Jewish, Eliza was the daughter of John Levy and Sarah White, who were not of Jewish origin. The family surname had been changed from Lever to Levy, and John Levy was the son of William Lever and Mary Waters. I don’t know if this was just comedian tongue and cheek sensibility or not but here’s a link to a quote from an interview that states Moore may be Jewish. I’ve read that Moore “discovered” she has a Jewish grandfather. Perhaps she discovered that her maternal grandfather’s mother, Eliza Charlotte Jane Gutteridge, was the daughter of Mancell Powell Bagshaw Gutteridge and Eliza Levy, and assumed that Eliza Levy was Jewish. However, Eliza Levy actually came from a non-Jewish, English line of Levys, and the name was “Lever” a few generations back. That’s my best theory on her statement. Added it to the page now. Reminds me of Tom Arnold, who said he had a Jewish ancestor named “Cohen”. The name was actually “Coen” or “Coens” and they almost certainly weren’t Jewish. However, Arnold himself is a convert to Judaism. Just out of curiosity why do you believe Tom Arnold’s Coen relative wasn’t Jewish? I know Coen is a less common spelling for Jewish surname, but there are Jewish Coens like the brother directing duo Joel and Ethan Coen. Arnold’s ancestor was Eleanor/Elenora Coens/Coen. Eleanor is sometimes cited as the daughter of Frederick Coens. I’ve seen Frederick Coens traced as being of Dutch and/or German ancestry. I couldn’t find any Jewish families named “Coen” or “Coens” living in New Jersey in the late 1700s/early 1800s, when these ancestors were there. Arnold himself cites the name as “Cohen”, but he’s definitely off about that. There is also a similar name, “Coenen”, that is almost never Jewish, like Paul Rust’s grandmother. There are people that stray away from their families and immigrate on their own, so it’s possible Tom’s grandmother could be a representative of that trend. But I see why you’d rule that out. As for Rust I know he was raised Catholic, but I thought he had Jewish heritage like Don Adams. In fact I’ll link a page on his profile. No, Rust has no Jewish ancestry to speak of. Don Adams has nothing to do with him.